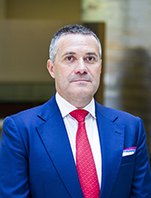 Mr. Erik Helberg is the CEO of Clarksons Platou Securities. Prior to joining RS Platou Markets in 2009 as CEO, Erik was Partner & Head of Shipping Research at Pareto Securities. He has received numerous awards from top analyst ranking agencies such as StarMine & Prospera, and holds amongst other awards, three #1 rankings as best stock picker in Europe/Norway. Erik has extensive industry and business experience from all types of ECM transactions and M&A assignments in Europe, Asia and the US and holds a Master of Science degree in shipping, trade and finance from City University Business School in London and a Candidatus Magisterii in law from the University of Oslo.